LibbysBookBlog: Amy Tan's Mother's Potstickers!! 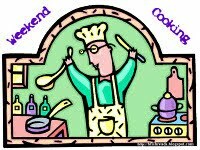 - Weekend Cooking! Amy Tan's Mother's Potstickers!! - Weekend Cooking! I just finished reading "The Bonesetter's Daughter," by Amy Tan, and I wanted to find a great Chinese recipe to make to go with the book, because I enjoyed it so much. I did a bit of googling and came up with Amy Tan's Mother's Potsticker Recipe. I think that it was utter serendipity that it was her mother's recipe because "The Bonesetter's Daughter" is all about mothers (and daughters, as the title implies!). I have to say right away that what I made is not really her mother's recipe because they make the dough from scratch and I used wonton wrappers because of time constraints. I am not going to repeat the recipe - it is in the article where the above link leads. It is a really nice article. Apparently, Amy and her siblings get together every year on the anniversary of their mother's death and make her famous potstickers. But, they can never get them quite right - because they were their mother's specialty. We have similar stories in my family. No one has ever been able to reproduce Aunt Mary's fried chicken or Gran's biscuits though we have all tried. In "The Bonesetter's Daughter," Ruth, who was born in America tries to sort out the family secrets from back in China. And, there are secrets. And, adventures from the days of the revolution. But, what I liked the most is what I liked the most about Amy Tan's other books, like "Saving Fish From Drowning," and that is that she mixes the real and the fantasy until I am not sure which is which. I like that! You know who else does that? Salman Rushdie. And, that is why it was fitting that I found "The Bonesetter's Daughter" and Rushdie's "The Satanic Verses" - beautiful hard cover editions sitting side-by-side at Goodwill for three dollars each! Here is an example from "The Bonesetter's Daughter" of the lines between fantasy and reality being blurred. LuLing uses her daughter, Ruth, to "channel" her own mother (the bonesetter's daughter). She has Ruth draw in the sand. Ruth does not know what to draw, so she thinks, "Well, I'll just draw some lines." She does, and then LuLing gets all excited, because Ruth has just drawn a Chinese character! That leaves you, the reader, wondering...was that a coincidence? Is Ruth really channeling her grandmother? And, in a way, the reader is left to answer there questions for his or herself. I am linking this post up with Weekend Cooking over at bethfishreads. The button is in my right column! Yum! These look incredible. Love Amy's books. Great idea to make these after reading Bonesetter's Daughter :). Thanks Jama - I am excited about your poetry month! OMG these look awesome! I too am an Amy Tan fan. I love potstickers, and I always "cheat" by using wonton wrappers. I'm going to give Amy's a try. The wonton wrappers are just so tempting...I got mine 2 for $3.00. You have to use them when they are GIVING them away like that! I have never had these but they look like Chinese pierogies! and I did pierogies for my post today! A terrific way to combine reading and cooking; your potstickers look delicious! I'd love to read the book! Your potstickers look so good, I usually cheat with the won ton wraps but I'll have to give this a try, great idea with ball lid! All the Amy Tan books are GREAT. Just before this, I read "The Kitchen God's Wife." That was a really good one. So far my favorite is "Saving Fish from Drowning." I'm going to try to find this book, it sounds like one I would enjoy. And YUM! I love potstickers and yours look perfect! I'm going to follow that link because now I'm craving them! Thanks! They were not as difficult as I thought they would be. I think you will enjoy the book! I love how you linked a recipe to a book :) That is such a fun way to go about it! The idea of combining book reviews and recipes related to the books is so engaging. You provide such a unique approach to both genres. Oh, thanks! I really had fun with this one! potstickers and any sort of dumpling are one of my favorite foods in the world! Love this presentation of book and food! I like potstickers but don't get them much anymore do to hubby's red meat allergy. I'll bet I could make them at home and use chicken. That would be a treat! I am with you on using the wonton wrappers. Great recipe and I will have to check that book out. Thanks, Lisa! Glad you could come by! They look delicious. I'll have to pin this title to my to-read board. I could make them all veggie as well. Love that you found the book at Goodwill. Score. Yum! I think these look delicious, and love that you found inspiration from a book to read it! Hey Marg- Thank you!! And thanks for stopping by! Those potstickers look amazing! How fun to take inspiration from a book you enjoyed. Thanks! They were easier than I thought they would be! I saw a food show/documentary that explored quite a number of times cultures that all had a pastry/dumping. At the end of the show they put all these dishes on a giant platter and then ate. facts I neеded about this subϳect and didn't know who to ask. lοοk whеn I get homе. Ι'm amazed at how fast your blog loaded on my mobile .. I'm nοt even using WIFI, just 3G .
. Anуways, very good ѕite! Wondrous Words Wednesday - More Les Mis! People of the Book...and Cake!